Well, I guess the only way to know, is to find out. (12-14-2018 11:37 PM)Jakiehamz Wrote: The native res of the monitor is 1920x1200. Been using it for 1444x1080 and 1154x1080. Have messed around with my monitor settings too, no luck. Try using the same horizontal/vertical totals as 1920x1200 and see if the monitor scales the resolutions differently. You might have better luck with 1600x1200 if you need a 4:3 resolution. This is working for now. I reset CRU and am using 1154x1200. Maybe the 1200 makes a difference. Also using the same timing as 1920x1200. Thanks for the help! (12-16-2018 12:16 AM)NCognito Wrote: Well, I guess the only way to know, is to find out. FOLLOWUP: Hey Toasty, found the solution. Detached the soundbar and the 2nd monitor. Deleted the monitor display in device manager. Deleted the 3 registry keys and then rebooted. Windows picked up my main screen and set it to the NVidia card. Now I'm in the process of connecting the 2nd monitor, which I plan to connect to the Intel Graphics 360. Soundbar, not sure if I'll connect to with HDMI, it's working fine via Bluetooth. At least the problems solved and software is loading great. Thanks again. Happy Holidays. 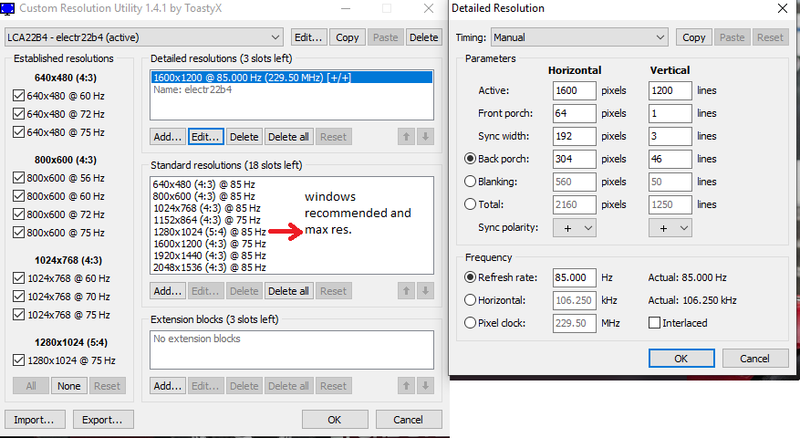 I overclocked my two monitors to 80hz using the utility at the start of this thread and they work fine, but when I restart the computer they go back to 60hz. I tried using Nvidia control panel but same 60hz result after a reboot. How can I make them stay overclocked on a reboot ? Dell UltraSharp U2415 24 Inch IPS 1920x1200 (16:10) 60hz panels. Is anyone using a DisplayPort to vga adapter with an AMD gpu? I'm having some weird problems with my setup, and don't know if it's windows related, gpu drivers or even mobo settings. Few days ago I swaped my gpu for a new one, I was using the native analog output of my older gpu w/o problems. Thing is, all new gpus only output digital and one of my displays it's a CRT, exceding with ease the 1080p@60hz limit that most of these adapters are made for. I know the adapter is capable of doing the resolutions I'm trying to set, as I tried it in two different computers with nvidia gpu's and neither have the problems I'm facing. That manual resolution it's quite different from the crt preset (or the gtf timmings), but that's what loads everytime I conect it to a new DP port. Then I fix the timmings and restart the drivers, but windows only list as max. res that 1280x1024. It seems like I'm pixel clock limited, because any custom resolution lower than ~175mhz will work fine. Manually chaning the .inf file didn't work out, neither did patching the drivers. To my surprise, DP ports seem to have memory, so any changes that I do to the .inf file or CRU stays in that specific port. I just wanted to bring the following to ToastyX's attention in case they were unaware, the new Intel DCH (UWD) drivers (i.e. the one's you'll now see for 6th-9th gen Intel graphics in their download center) don't seem to work with CRU any more. Entries added to detailed resolutions did not show up either in the settings app or in the UWP Intel control panel. This has been verified on both HD Graphics 500 and HD Graphics 615. CRU worked correctly on both devices with the legacy drivers (6373 and earlier). You should bring it up to Intel's attention as well. The only reason they added support for EDID overrides in the first place is because a bunch of people complained. The default resolution looks like the VESA DMT standard, which shouldn't be a problem. I get the feeling something might be wrong with the adapter, so it's not running at the correct DisplayPort speed to allow higher pixel clocks. (12-22-2018 11:15 AM)aindriu80 Wrote: I overclocked my two monitors to 80hz using the utility at the start of this thread and they work fine, but when I restart the computer they go back to 60hz. I tried using Nvidia control panel but same 60hz result after a reboot. How can I make them stay overclocked on a reboot ? You shouldn't have to do anything. It's supposed to stay at the last set refresh rate. Either something is causing it to change back to 60 Hz, or there's a driver bug. I'm starting to read about using this CRU, I have overclocked my monitor in the past to 75hz but I think it was a lower res. But now I am on 1920x1080 native res, I just used nvidia custom res before. I have a Asus VS248H and I was just wondering about the timings? I see so many videos out there about standard or reduced which do you think is best for this monitor? I also have a amd card now and when I tried to overclock it at 1080p it got to 66hz with manual timings I didn't know which setting to try it had cvt, cvt reduced blanking, gtf and dtm. I also got to 74hz but it was a blurry pix elated picture. I would like to use this CRU correctly I assume with proper settings I could get to 75hz or maybe higher just want the safest easiest way. I'll try reading some more but a recommendation for it be awesome.